Arguably the most relevant thing to our interests that was announced during the WWDC keynote this morning was iOS 8’s new Metal feature. Assuming you’re playing a game that has been optimized for Metal, that particular game should perform way better. Backing things up a bit, the disadvantage iOS hardware has always had over dedicated gaming consoles is a total lack of direct access to the hardware. Everything you do on iOS has to go through OpenGL, which in the simplest way I can describe it basically serves as a middleman between the game you’re trying to run and your iOS device’s processor that’s doing the heavy lifting. Comparatively, something like the PS Vita is far closer to having its software interface directly with its hardware which is among the many reasons why dedicated consoles can squeeze out such great graphics with (in some cases) so little horsepower. Again, this is a gross over-simplification, but if you imagine things before Metal as there being a translator in between the game you’re playing and the hardware rendering it, with Metal that translator is reduced to the point of being almost a non-issue. 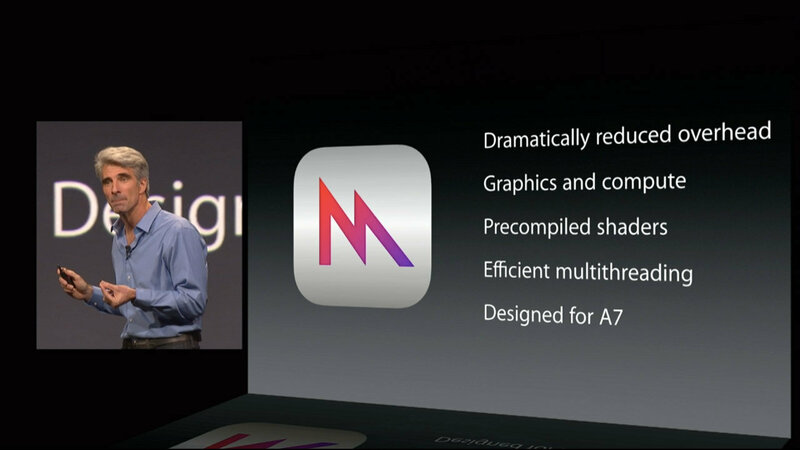 As such, Apple is boasting a 10x boost in rendering performance for Metal-optimized games. During the keynote, Plants vs. Zombies: Garden Warfare was running inside the Frostbite engine used on consoles and Epic appeared on stage to demo an amped up Epic Citadel (Free)-like Zen Garden which provided some insane visual effects. Talking to developers outside of the keynote, many mentioned that the optimizations Apple is making could have a very significant impact on game performance. Like everything, it comes with a catch- Taking advantage of Metal is going to require developers spending potentially significant amounts of time optimizing their game specifically for the iOS platform. These days, many developers work in multi-platform development environments like Unity, hoping to cast as wide of a net as possible by releasing their games on iOS, Android, PC, and any other platform they can. According to developers I’ve talked to, the most realistic thing for gamers to expect is for existing Unity games to get a little better once Unity supports Metal. Unity games often come with their own overheard compared to developing natively specifically for iOS, so most developers think that when Unity supports Metal, the Unity overhead and the Metal performance boost will likely cancel each other out- Resulting in Unity games that play better than Unity games typically do across the board. I’m sure there will be benchmark titles exclusive to iOS that take advantage of Metal in crazy ways that produce some jaw-dropping graphics… But, it seems a more realistic expectation is that existing Unity games, once updated follow the launch of iOS 8 will probably run a little better than they do now. Previous PostPrevious Apple’s WWDC 2014 Keynote Live Stream is Starting Now!